The Guinness World Record for the largest Easter egg hunt occurred April 1, 2007, at Cypress Gardens Adventure Park in Winter Haven, FL. On that spring day, 9753 children and their parents searched for 501,000 Easter eggs! It’s quite amazing how much joy a colorful little wooden egg, hidden in the yard, can bring. And while the scale of your own Easter egg hunt is unlikely to rival the Guinness record (ah, you probably don’t want to try that anyway! ), you can certainly create an event – even tradition – that guests will remember. The essentials of a successful Easter egg hunt include a safe venue, kids, parents, brunch, prizes, baskets and, of course, Easter eggs. 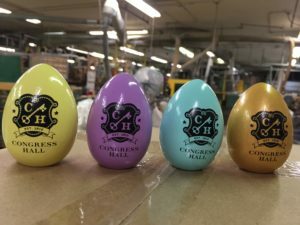 Wells Wood Turning can provide a variety of colorful eggs personalized with an imprint of your emblem or logo. Colorful wooden eggs with smart imprints are visible when hidden in the grass, bushes or behind drain pipes. These eggs are keepsakes, taken home, reminding your guests of your event for years to come. My family has been holding Easter egg hunts at our home in Portland for many years. Through daughters and cousins, friends and family, mud and sleet, we’ve compiled a short list of considerations to help make your event a success. Engage in some planning, and share your plan with friends and family with adequate advance notice. Decide on a date, time and venue for the event. Keep family and religious obligations in mind. How about the Saturday before Easter Sunday? The White House Easter Egg Roll is usually held on the Monday after Easter Sunday, but Monday may be difficult for many families. 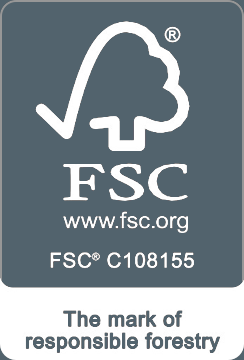 Estimate how many kids and parents will attend your event. This will help you figure out how many eggs you will need. We figure about a dozen wooden eggs per guest should do the trick. Eggs can all be painted the same color, or you can mix several colors in your purchase order. Pastels are always popular. Decorations get visitors in the party mood! Bunny cut-outs (dare I say a bunny costume? ), colorful balloons and streamers help set the stage. With safety in mind, set boundaries for the egg hunt, and communicate these boundaries to your visitors. Inspect the area for dog poops, mice or birds caught by the cat, or lawn holes that need to be filled. Pick up any trash or debris. When placing the eggs around your venue, vary the hiding places based on the ages of your guests. No harm in being a bit mischievous in your hiding. For added competition and excitement, hide several gold eggs around the venue. Kids who find the gold eggs are entitled special prizes. When you’re ready for the egg hunt to begin, release kids by age group, with the youngest going first. Give them a few minutes to put the easier-to-find eggs in their baskets, with parents providing encouragement and guidance. Then stand back and release the older kids! The hunt is not over until the last egg is found! Keep a count of the eggs you’ve hidden, and remember where you’ve hidden them. Some parents have even created a little treasure map (“x” by the tree marks the spot, kind of thing). At least share hiding locations with other parents and run an inconspicuous spot check from time to time. Everyone should get a prize. You can pick up low-cost, fun prizes (small toys, stickers, temporary tattoos, candy) at a local arts and craft store or dollar store. At the conclusion, thank the parents and your friends for being part of your Easter event. You can do this with our gold eggs, where parents and friends receive a commemorative gold egg as they head out for the afternoon. It’s not unusual for visitors to place the memento on their fireplace mantel or living room bookshelf. Your own Easter egg hunt doesn’t have to land you in the Guinness record book to be successful. With a little planning, some creativity and colorful eggs from Wells Wood Turning, you can host an event – or maybe start a tradition — that family and friends will remember for a long time.